The horror of shipments like this is most visible when the strong birds have flown out of the transport cages, leaving the weak ones behind. 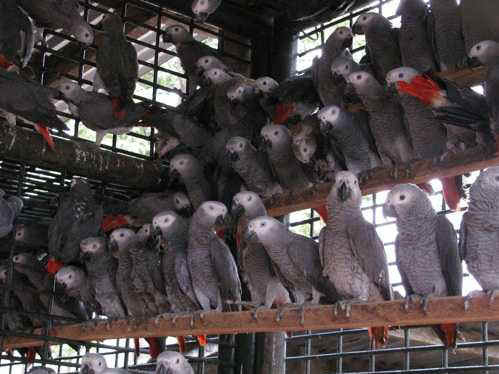 Hundreds of parrots were rescued and transferred to the Limbe Wildlife Centre November 29, 2009. They were confiscated at the Douala Airport, where they were kept prior to being shipped out of the country. The illegal animal dealer has fled. 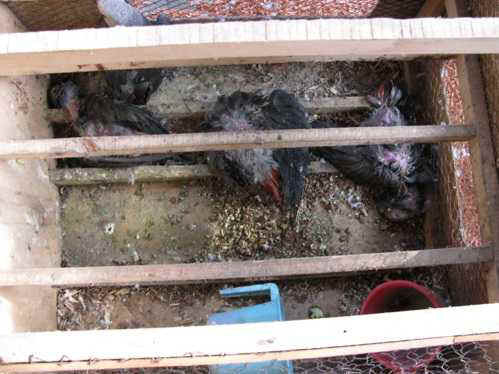 The parrots were sitting in 10 crates, covered with lice, without food or water. By the time they arrived in the Limbe Wildlife Centre, seven animals were dead and four more died soon after arrival. Fortunately we had space in the quarantine, so we quickly prepared an enclosure for them. Our carpenter rushed to the market to get perches and find saw dust for on the floor. Some others went to buy corn, cassava, peanuts and palm nuts in order to prepare the food. In no time the ape quarantine enclosure was changed into a flight cage for parrots. The parrots were off loaded and less then 2 hours after arrival they were comfortably settling down in their new temporary home.